PGA Village is home of the PGA of America Golf Schools. Instruction is offered at the The PGA Learning Center, a state-of-the-art golf technology facility operated by PGA and ranked among the best in the world. Surrounded by exceptional golf courses designed by Thomas Fazio and Pete Dye, this world-class facility with 35 acres of private areas for instruction and practice, provides state of the art teaching tools and PGA Professional Certified Instructors, many ranked among the Top 100 teachers. The PGA of America Golf Schools is proud to offer customized and affordable instruction programs focused on Golf Skills, Motion, Equipment and Playing strategies taught by top PGA Professionals for players of all skill levels. 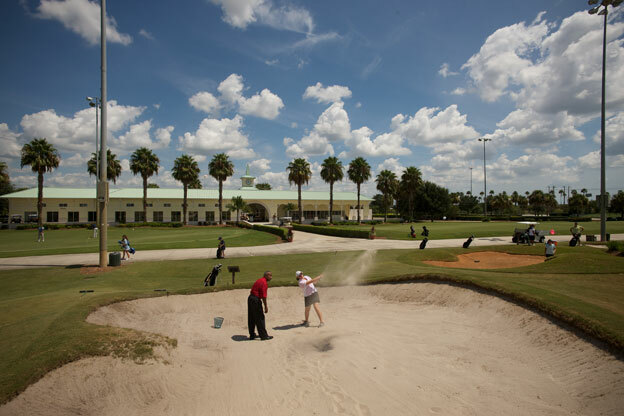 The facility also includes a separate pitching, chipping and putting areas, a bunker complex that features nine bunkers with various types of sand to simulate play from around the world, a fitness and performance lab and a golf pro shop. For Golf Packages, visit our Stay & Play Page or Call 888-612-0706.